You are here: Home / News / Winter CSA begins! This first week of winter CSA is coinciding with the first taste of actually wintry weather that we’ve had so far on the farm and frankly, we need it. 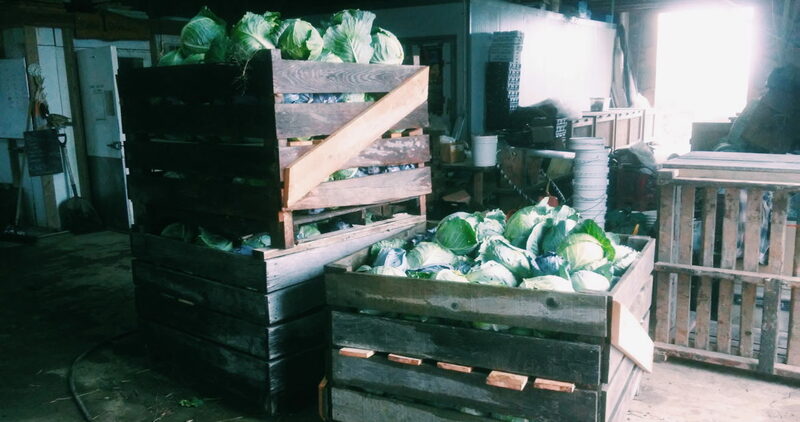 Our winter storage rooms rely solely on ambient temperature to cool down enough to store veggies and so far, we have had barely enough cold nights to cool these rooms down. That means we haven’t been able to dig in (literally!) to harvesting winter crops in earnest until this week. And this is the last week we have staff! But thankfully it looks like we’ll have some good cold nights and days this week so we can pull in the remaining crops that are in the ground. So far we’ve got cabbage and kohlrabi, potatoes, rutabaga, turnip and beets in our cold storage and we’ll hopefully finish off the carrots, celeriac, radish, parsnip and napa cabbage by Friday (or Jeff and I will be harvesting them by ourselves next week!). It is always extremely satisfying to be pulling out dense winter veggies at this time of year knowing that they will be feeding our members and ourselves well over the cold winter months. These vegetables are highly nutritious and very tasty and are very suited to winter storage. In fact it always amazes me how well farmers before us bred these amazing veggies to remain sweet and flavourful as well as crisp over many months of storage. These ancestors of ours clearly knew what it took to survive a winter when they bred these dense and nutritious crops. The other neat thing about these winter storage crops is that most of them actually get better with frost. This year we’ve had some really rockin’ winter crops – cabbages that weigh up to 5lbs each, huge celery roots, beautiful parsnip and more! We also grew Brussels sprouts this year and they look like the are sizing up well for a tasty treat in early December. We’ve also had a few busts as well, particularly our garlic which was diseased and began rotting in storage. You can expect the veggies mentioned above and more in your shares over the winter as well as greens like lettuce, spinach, kale and arugula that we harvest from our hoophouses. As I mentioned above, this week is our last this season with our awesome staff – Heather, Jess and Stone. These folks worked incredibly hard this season planting, weeding, tending and harvesting your crops. They worked hard and well and did it with good humour, kindness and enthusiasm and we are grateful for their energy and presence on the farm. We couldn’t do it without them! We’re thrilled that Jess will be back next season. Stone has been working with us for the past two seasons and is now moving on to other wonderful things. We will definitely miss our good friend and co-farmer around here but are super thankful for Stone’s work and company on the farm these past two years.